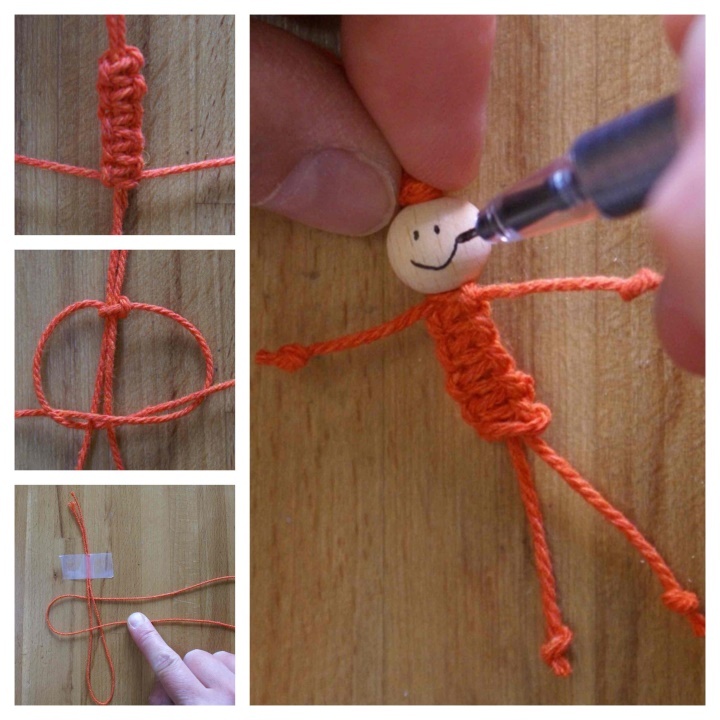 make such a funny doll, you just have to. Firstly, it is very pretty, secondly, it will take you only a few minutes to create it, one wooden bead and a couple of meters of thin cord. Initially, prepare all the necessary materials - bead, cord, scissors, adhesive tape (or tape), felt-tip pen. Attach the cord on a horizontal surface in two layers (ends up) about 15-18 cm long (this will be the length of your pupa). Down put the rope from which we will weave the "body" of the pupa. It must be at least a meter in length. Fold around the right side of the cord to the left. Make a bundle, as shown in the picture. You will have it on the right side. Do the next knot on the left side. Also bend around the fixed rope, but on the other side. In this way, tie a fixed cord about 10 cm. Using a needle and a hook in the upper part of the body, stretch the cord behind the body of the pupa, tie the knots - these are our hands of the pupa. Use a felt-tip pen to draw the “funny face” of your pupa. Cut the central cord, tie two knots - these are legs. All - happy doll is ready!